Goa is celebrated globally as a destination for hedonists, beach bums and hippies, but this beautiful state now attracts people of all kinds to holiday on its picturesque shores. Families and millionaires are as likely to be seen there as backpackers. The big drawcard is Goa's beaches, but there is fun to be had beyond the golden sands. Goa was a Portuguese colony until 1961 and the state's natural bounty is complemented by the colonial splendour of Old Goa and parts of Panaji. There are many temples and churches of note to explore for holiday-makers who can drag themselves from the beach. Goa also offers interesting cuisine, fabulous shopping opportunities, and, of course, some seriously good parties. There is no disputing that Goa's nightlife is the best in the country, and it is a dream destination for lovers of trance music. Goa is uncomfortably hot and humid during summer, and the monsoon rains arrive between June and September. Therefore, the best time to visit Goa is during the state's short winter, between November and February, which just happens to coincide with the extremely popular New Year's celebrations. October and March are good months to visit to avoid the crowds and the parties as well as the worst of the heat, but many facilities will be closed. Find out more about Goa's Weather and Climate. -Explore the colonial splendour of Old Goa, a UNESCO-listed site. -Visit the Dr Salim Ali Bird Sanctuary and explore the mangroves. -Take an excursion to the Dudhsagar Waterfall, and enjoy the views. -Enjoy the unspoiled beach paradise of Palolem. -Shop for souvenirs at the renowned Anjuna Flea Market, before hitting the beach. -Go swimming at the picturesque Baga Beach. -Trawl the bars, shops and restaurants at Calangute Beach. -Stroll through the cobbled streets of the state capital, Panaji. Many visitors choose to combine a Goan beach holiday with the urban delights and challenges of the city of Mumbai. Mumbai and Panaji are joined by a quick rail link making this trip easy. Another nearby city with many worthwhile attractions is Bengaluru, and some choose to travel all the way south to enjoy the beauty of Kerala and Kochi. Also known as Dabolim Airport, Goa International Airport is the only airport in the state of Goa, and provides a gateway to the state's exotic beaches and spectacular temples. The airport is located 18 miles (about 29km) southwest of Panaji. Get more information on Airports in Goa. -Goa is the smallest state in India. -The first printing press and the first medical school in India were in Goa. -Though the smallest state in India, Goa has more than 6,000 bars - nearly two per square kilometre. This small state, halfway down India's west coast, was a Portuguese colony until 1961, which goes some way to explaining the alternative atmosphere found in the region. Cut off from British India by a wall of mountains and vast plains, Goa relied on trade with a declining Portuguese Empire. However, what was lost in terms of British trade was more than made up for in terms of Portuguese attitude. 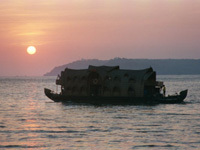 To this day, Goa retains a distinctly laid-back and relaxed feel. Goa was 'discovered' by travellers in the late 1960s, when many were searching for somewhere unique and off the beaten tourist track. Goa quickly became a kind of hippie paradise, where holidaying meant simply hanging out and partying on the beach (particularly during full moon). The state quickly grew a reputation for its hedonism and liberal attitude, not to mention its hot sun, that sets in splendour every evening over the Arabian Sea. In recent years, though it still hosts epic trance music festivals (such as Sunburn), the authorities of Goa have tried to discourage hippies and budget backpackers from swamping the area, angling rather for clientele with fatter wallets, with the result that Goa is slowly losing its reputation as India's 'party central'.